DAVIS, Calif. (KRON) - Authorities have identified the gunman who killed a Davis police officer Thursday evening. According to the Davis Police Department, 48-year-old Kevin Douglas Limbaugh is the suspect who gunned down Officer Natalie Corona. At around 6:30 p.m. Corona was responding to a three-car collision in the downtown area Davis when Limbaugh rode up on a bicycle and opened fire. Authorities say he was not involved in the collision and appeared from the shadows. Officer Corona was struck at least once in the neck and fell to the ground. Once Corona was down, Limbaugh unloaded his magazine, reloaded and opened fire again. Several bullets struck a fire truck, nearby home, and bus that was passing by. A bystander said a bullet was lodged into a textbook that was in his backpack. After Limbaugh reloaded a second time, he ran towards a fire crew. As one firefighter tried to get away, the suspect shot in his direction, hitting his boot. The firefighter didn't sustain any injuries. Authorities say Limbaugh fled the scene and circled the block where he went inside a home. Police Chief Darren Pytel said the suspect spoke with his roommate as if nothing happened. While fleeing the scene, the suspect dropped his backpack which ultimately led officers to his location. Responding officers surrounded the home and gave commands for the man to come out. He eventually came out wearing a bulletproof vest, then went back inside. He came out another time, this time wearing a vest and holding a firearm. He retreated inside the home, pushed a couch against the door and shot himself, police say. Officers heard a gunshot and sent a robot inside the home. The robot had a camera that sent images back to officers which confirmed Limbaugh was dead. The Davis Police Department wouldn't release any personal information on the suspect until the Yolo County Coroner's Office identified the body. 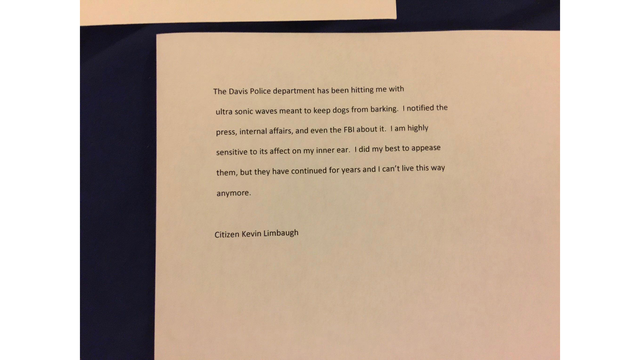 Authorities say Limbaugh left this note saying he told multiple agencies that the Davis Police Department was using “ultra sonic waves” against him. According to documents obtained by KTXL, in September 2018, Limbaugh was facing a felony charge for battery with serious bodily injury after an incident at Cache Creek Casino Resort. The casino’s spokesman, Micheal Traum, confirmed that Limbaugh was employed at the casino resort at the time of the incident. “As indicated in court records, the suspect was an employee of Cache Creek Casino Resort who was involved in an altercation in September 2018. The incident was reported to the Sheriff’s Office and the suspect’s employment ended immediately thereafter. We cannot offer any further details on this personnel matter,” Traum said in a statement submitted to KTXL. The charge was reduced to a misdemeanor through a plea agreement.